How about a Game of… Quidditch? I have been wondering for some time what kind of games Columbusites would be playing in Harrison Park when they finally discovered the open field on the north end. Flag football seemed the most likely possibility. Maybe frisbee golf or ultimate frisbee or kickball. Quidditch, however—the once-fictitious game featured in J. K. Rowling’s popular Harry Potter series—never crossed my mind. Being a bit dense on occasion, it still didn’t occur to me that we had Quidditch players in town when I saw a pair of college-aged fellows walking through the neighborhood with brooms between their legs. “Weird” is the only word that came to mind. 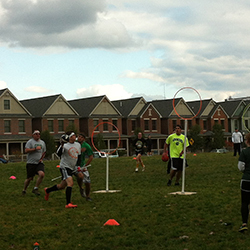 When I went for a walk along the Olentangy Recreation Trail, though, I stumbled on a full-blown “Muggle Quidditch” match. Neighbor Chris Ruder shared that we were watching the OSU Quidditch League.